This is a sample itinerary for our Private Gaudi Tour. 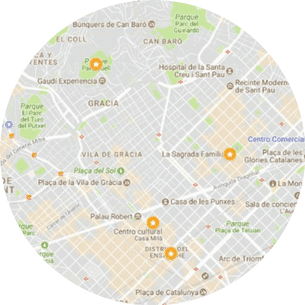 Your Gaudi architecture tour starts in Passeig de Gràcia, the main street of Barcelona and the heart of the Eixample District, where Modernism was developed. Here are located two Gaudi buildings: Casa Batlló is a colorful apartment building remodeled by him in 1905. It makes part of the Block of Disagreement where two other remarkable architects of the time worked as well: Puig i Cadafalch (with his Casa Amatller) and Domènech i Muntaner (with his Casa Lleó Morera). Only 3 blocks further, Casa Milà / Pedrera was a controversial apartment building, that the Barcelona society wasn’t ready to understand in Gaudi’s time. He was heavily criticized then, but now this building is considered one of his masterpieces. It was also the last private project Gaudi accepted before devoting himself exclusively to the Sagrada Família Church, 1906-1910. Next, a taxi ride (no subway option here) will take us to the Park Güell: another unfinished project, commissioned this time by his best friend and patron Eusebi Güell. Although it never became the planned community that it was meant to be, but it’s now the most fairy-taleish park in Barcelona. You’ll be fascinated by the colors of its mosaic tiles, and you’ll also enjoy great views over Barcelona. Finally, another taxi ride from it is located the breathtaking Sagrada Família Church, his absolute masterpiece to which he dedicated the last years of his life until his death (he could already tell then that the project would take several generations to be completed). Following his wishes and the plaster models he left (reconstructed after the damages caused by a fire during the Spanish Civil war in 1936), the construction has continued and now it’s scheduled to be finished by 2026-30. Pope Benedict dedicated the inside in November 7, 2010 during a solemn multitudinous mass. At the end of the tour, if you booked a taxi tour, your guide can put you on a taxi or give you directions to take the subway or walk back to your hotel. Or you might decide to stay inside the Sagrada Familia (or last site visited) and continue enjoying it on your own. If you booked a chauffeured tour, you’ll be dropped off back to your hotel or apartment, or at some local restaurant for lunch on your own. Some outbound links might be affiliate links. Click to learn more. Sign up and we'll contact you as soon as they are available. And get also all our best tips to prepare your stay in Barcelona!